Swami Ramdas , who was known as P. Vittal Rao during his pre-sannyas days, was leading an ordinary life till God’s grace descended on him in or about the year 1920. Then he made to think deeply on the futility of worldly pursuits and the necessity of pursuing the divine path and realizing one’s identity with the Supreme Being, which alone can lead one to Peace-eternal.’ He placed himself totally at the altar of God. At this time his father initiated him with the holy and all powerful Name of God-Ram Mantra. He took to ceaseless chanting of the holy Name. When the prompting came from within to renounce worldly life he took to wandering mendicant’s life. Fiery aspiration coupled with intense practice to attain the Highest hastened his spiritual progress and, in a short time, he could behold his Beloved God-everywhere, both within and without. He thus showed how absolute surrender to God, arising from his constant remembrance by chanting of his name could lead to ultimate realization quickly and to getting himself established in unending Bliss. Having thus attained spiritual liberation and God-vision, he started on his mission to awaken mankind to the awareness of God. In 1931, he and Mother Krishnabai, his foremost disciple and a self-realised soul, founded Anandashram with the object of propagating the ideal of Universal love and service, this spiritual centre offers every kind of facility for spiritual regeneration of the soul so that it may realise its pristine divine nature. Swami Ramdas attained Mahavirvana in July 1963 and Mother Krishnabai in February 1989. The books authored by Swami Ramdas wthich come from the deeps of reality continue to inspire innumerable devotees both inside and outside India. 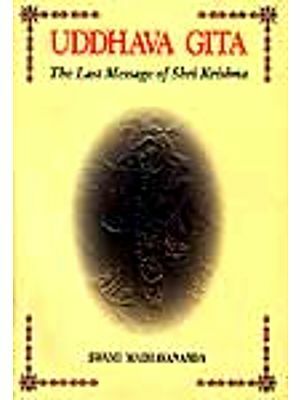 The message of Srimad Bhagavad Gita is so important and universal that if properly understood and practiced, it helps any man or woman in any part of the world to lead the life fruithfully for himself/herself and for others and at the same time enjoy each and every action, without being affected by its results and making it means for the purification of the mind and realization of the goal of human life. Srimad Bhagvad Gita explains to us clearly how we, deluded by ignorance, are identifying ourselves with the body instead of the atman which we really are, how we can get over this delusion and the resultant misery, realize our true being and existence and enjoy eternal happiness. These days it may be difficult for everyone to read and understand the original Sanskrit verses of Srimad Bhagavad Gita. Our Gurudev, Beloved Papa-Swami Ramdas and Pujya Mataji-Krishanbai, his foremost disciple, laid great stress on the importance of study of this sacred text for one’s spiritual progress. To make this study easy and understandable, Beloved papa has written short essays on each chapter of gita published as Gita Sandesh. 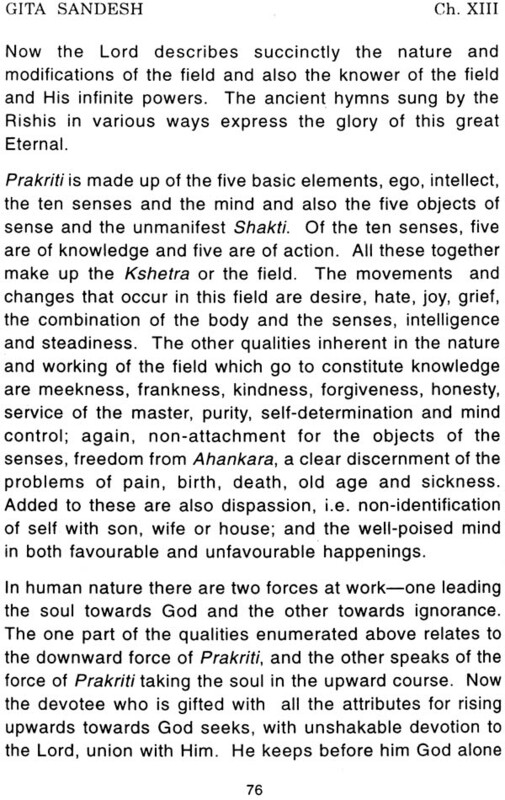 Based upon the universal vision grated by the Lord and fully conscious of the truth that the Lord and the devotee, the divine Parent and the child are one, this child-writer-composed this little work and takes leave to place it before the indulgent readers who are for him the very forms of his most beloved supreme Lord and divine Mother. The teaching of the Gita, in its very construction, it so built up that it might offer a progressive path for the sadhaka, aspiring for fro liberation and the attainment of the highest spiritual eminence, of perfect union with and absorption in the all-comprehensive being of the Godhead. 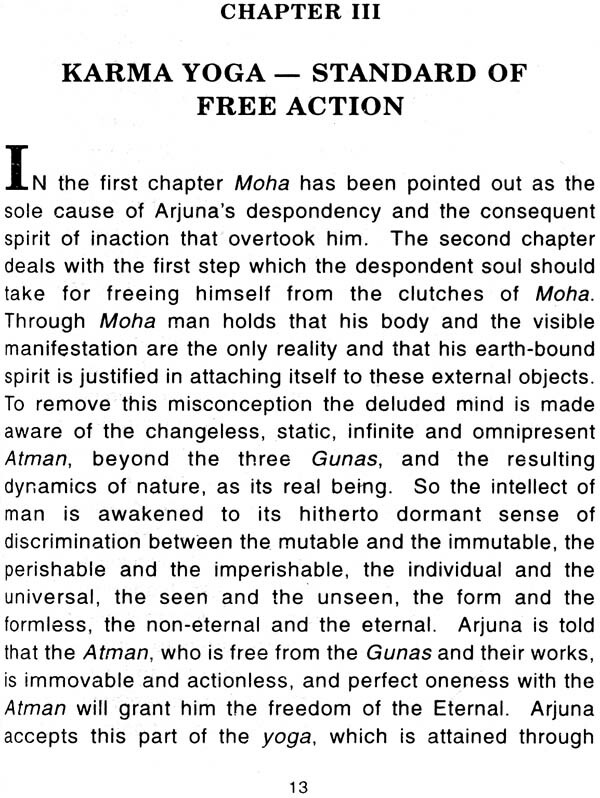 So this presentation of the Gita reveals the gradual ascending steps in the evolutionary process of the human soul* in his march towards this ultimate goal. 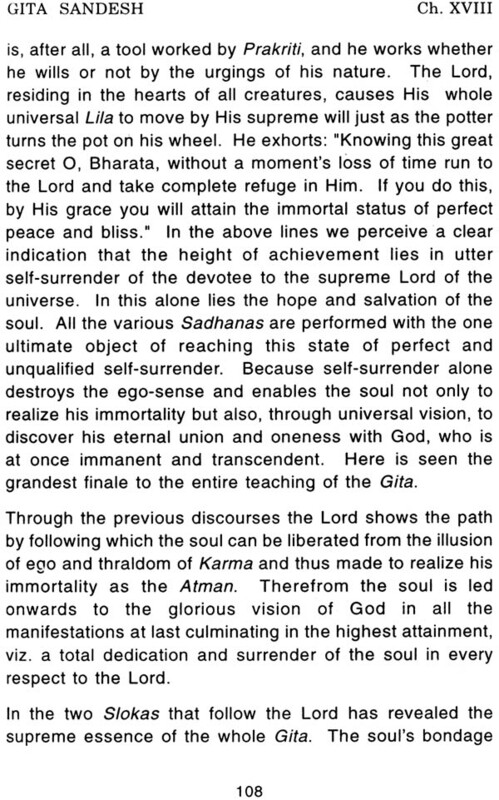 Gita’s message is primarily to the man of the world who, according to it, need not renounce the active life and its relations with the world, but can divinize all his action by a complete dedications of himself in his entire being, both as the immortal soul and as the active worker in the field of Prakriti, to the Lord of the Universe. 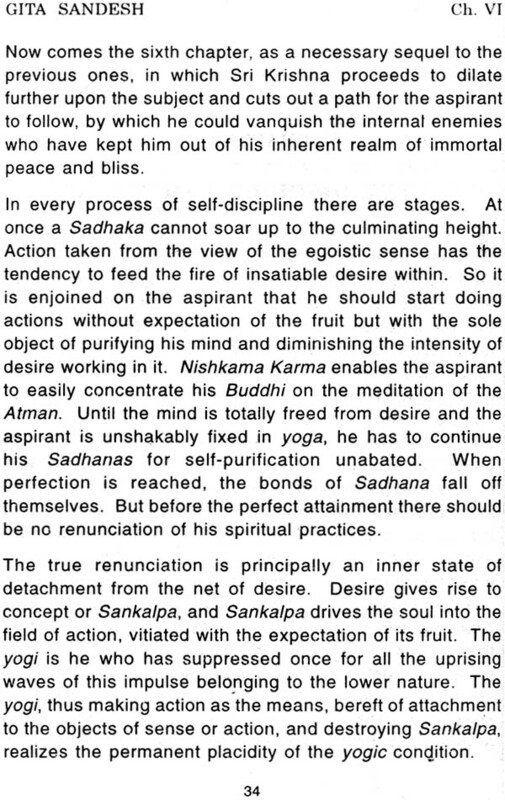 Sri Krishan holds yogic action as superior to renunciation of action. 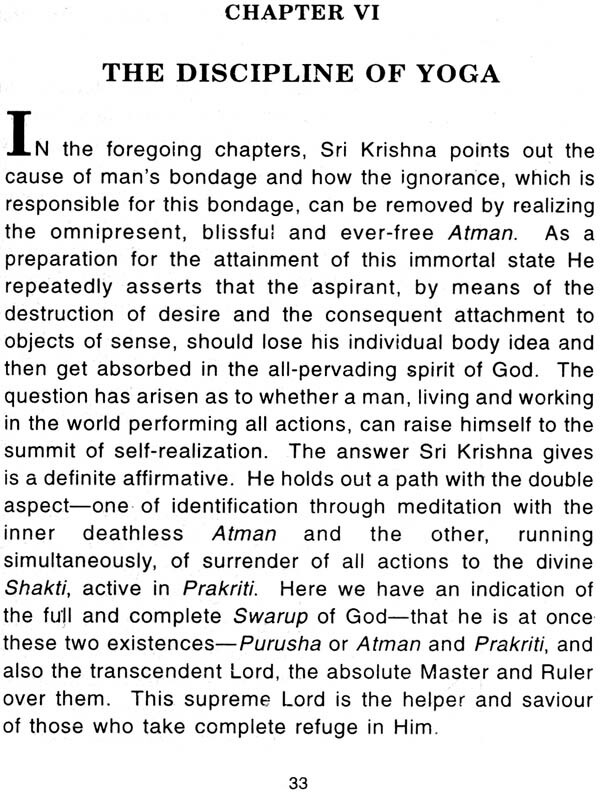 While the latter signifies a partial denial of life, the former denotes a transformation of the whole life into the very expression of the Godhead, by raising the ignorant soul from the human to his illumined, divine and eternal nature. All glory be to the Lord-the savior of Manking- the protector of the weak and helpless –the joy of His devotees –and the guide and friend of the aspiring souls –all glory be to the lord!